With Google Apps for Business, the Google Drive product can be used as a file system to share files with some or all people in your company. This article explains some best practices for setting this up. In this past article we explained the basics for setting up a shared drive to manage documents in your company. If you have more than a few people in your company, the following best practices will help ensure your file system does not degrade into chaos. Having a single, top level folder that contains all the shared folders and files underneath it will greatly simplify the management and maintenance of your shared folders. Here is an example of a structure you could set up, with “Company Share” at the top level. This structure would be setup in a trusted account, as described in the prior article on document sharing. Everyone has to be able to see the Company-Share folder. To prevent file-management chaos, you don’t want anyone to create sub-folders directly under the Company-Share (except the trusted account). Sharing the Company-Share as “Can View”, with everyone, will accomplish this. The people you share the “Company-Share” with will see this folder under “Shared with Me” or “All Items” (I’ve seen both cases). 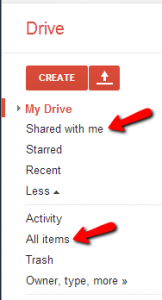 Instruct everyone to move this folder into “My Drive” in their account – either by dragging it into My Drive, or by pushing the button that says “Add to My Drive” when they view that folder. The folders under the Company-Share should be shared with the people in your organization according to their role. For example: the Management folder here would be shared as “Edit” with everyone in your management team, “View” to the management protege, and would not be shared at all (including View) with anyone else. Note 1: When sharing the second level folders do NOT check the box “Notify People via Email”. They already can see the Company-Share folder from the prior step, so you do not need to spam them with information about the sub-folders. Note 2: People who have Edit privilege on a folder can put both files and folders inside that folder. If you have a large company with hundreds of files at each level, then you may consider sharing this second level as View (rather than edit) to control the folder structure to one additional level. If you have (or will have) more than 10 people in your organization, then create Groups in your Google App account that are specifically for file sharing. Then share the folders to Groups, and not to individual people. This strategy will make life way easier when you add or remove staff from your company. In our example we would likely have at least four groups for file sharing that mirror the top level folder structure: management, finance, operations, and project-teams. In reality you may have one or two more Groups to control access to folders. Note: When Jane starts with your company you would add her account to the appropriate Groups. However, this doesn’t cause any communication to go to Jane. You must email her the link to the Company-Share folder, and instruct her to move the Company-Share into “My Drive” in her account. When you make a change to the share settings of a folder, this change ripples immediately to all the sub-folder and files under that folder. This can cause some problems if you are not careful. For example, you share the Company-Share folder to a new Group “Interns” that you decided to set up, but forget to remove that Group from the “Management” sub folder. So be very careful when changing permissions after you complete the initial setup. This entry was posted in Uncategorized on August 7, 2013 by robert@stratusforce.com.